This is another installment in our preview of hoarded treasures being reserved for our forthcoming “Extra Ink” catalogue. Expect the catalogue late in 2018. Over the coming months we will give you a sneak peek at some of the catalogue items in our blog posts. Today, Yousuf Karsh, Winston Churchill, and CBC’s hometown of San Diego. We are pleased to offer a special copy of one of the most famous photographic portraits of the twentieth century by one of the world’s most famous portrait photographers. 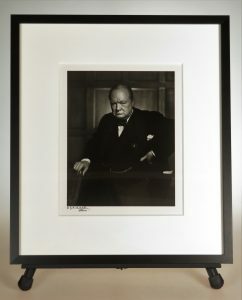 This is Karsh’s famous portrait of Winston S. Churchill, taken on 30 December 1941 in Ottawa, Canada. Moment, time, photographer, and subject converged to create both an incredible image and an incredible story to match. But first, a little local pride in the form of provenance. 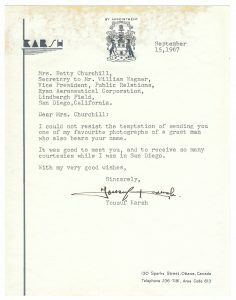 As you may know, Churchill Book Collector’s library makes its home in sunny San Diego, California. And this particular signed Karsh photo has San Diego history. Karsh’s presentation letter reads: “Dear Mrs. Churchill: I could not resist the temptation of sending you one of my favourite photographs of a great man who also bears your name. It was good to meet you, and to receive so many courtesies while I was in San Diego. With my very good wishes, Sincerely, Yousuf Karsh”. The story of Ryan Aeronautical Corporation was important not only to San Diego, but to both the history of aviation and the Second World War. 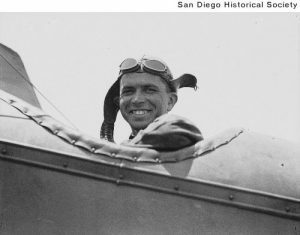 Tubal Claude Ryan (1898-1982) bought his first airplane, a Curtiss JN-4 Jenny, in San Diego in 1922, and began his aeronautical enterprises by charging for rides. By the late 1920s his aviation ventures included the nation’s first year-round regularly scheduled daily airline passenger service. In 1927, Ryan’s namesake company was tasked with building a single-engine plane that would be called The Spirit of St. Louis for a fellow named Charles Lindbergh. 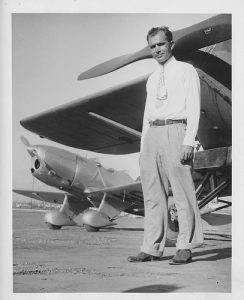 After Lindberg’s historic solo flight, in 1928 Ryan founded The Ryan Aeronautical Corporation. 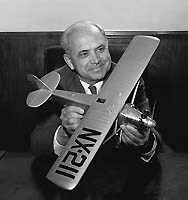 This company, among many accomplishments, built the preeminent trainer aircraft used though the Second World War, the first jet-plus-propeller aircraft for the Navy, and the first successful vertical takeoff and landing aircraft, as well as pioneering remotely piloted vehicles and jet drones, Doppler systems, and lunar landing radar. The Ryan Aeronautical Corporation occupied a portion of what is now the San Diego International Airport – formally known as Lindbergh Field. On that site, the company’s assembly-line built airplanes during the Second World War. In 1969, just a few years after this photograph was signed and presented by Karsh, Ryan Aeronautical became Teledyne Ryan, a subsidiary of Teledyne, at an acquisition price of $128 million. Teledyne Ryan became, in turn, part of Northrop Grumman in 1999. We are tickled about this photograph’s connection to both San Diego and to aviation history, not to mention a Churchill namesake. That said, we should not let San Diego exuberance overshadow the image itself. In the days after the Japanese attack on Pearl Harbor, the United States formally entered the Second World War, marking the end of Britain’s solitary stand against Hitler’s Germany, which it had sustained since the fall of France. Churchill immediately decided to travel to North America, and on December 12, 1941 he boarded the battleship Duke of York and began the 10-day trip across the Atlantic – a perilous journey at a time when German U-Boats plagued the North Atlantic. 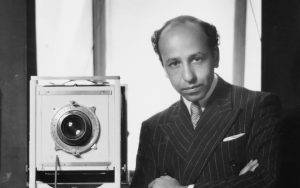 Injected into the middle of this historic moment was 33-year-old Yousuf Karsh (1908-2002). 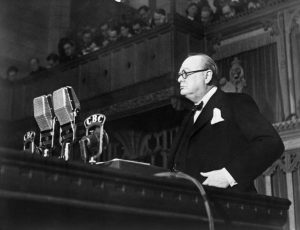 It was following his speech to the Canadian Parliament that Churchill was ushered to the Speaker’s Chamber, where Karsh had set up his camera and lighting equipment the night before. Born in Armenian Turkey, Karsh had fled on foot with his family to Syria before immigrating to Canada in 1924 as a refugee. After apprenticing with the celebrity portrait photographer John H. Garo, Karsh moved to Ottawa, where he opened a portrait studio with the intent of photographing “people of consequence.” His breakthrough came in 1936 when he photographed the meeting between U.S. President Franklin D. Roosevelt and Canadian Prime Minister Mackenzie King. After that assignment Karsh became a regular photographer with the Canadian government. 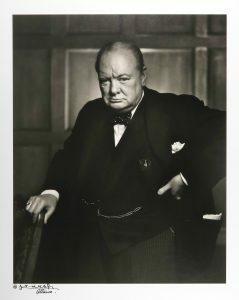 But it was Karsh’s photo of Churchill on 30 December 1941 that brought him his first international fame. Karsh titled the image “The Roaring Lion.” It appeared on the cover of Life magazine and established Karsh’s international reputation. In some ways, the image also can be said to have helped make Churchill; more than any other image, Karsh’s portrait of Churchill stands as the definitive portrayal of his character. Karsh went on to photograph an incredible array of the world’s most prominent personalities, including royalty, statesmen, artists, and writers. His portraits have come to represent the public images of major figures of twentieth century politics, science, and culture. Karsh also published numerous books as portfolios of his portrait photographs. He did not close his Ottawa studio until June 1992, at the age of 83. This silver gelatin photograph was printed by Karsh’s studio on bright, lustrous paper and mounted by the studio on heavy stock stamped by Karsh’s studio on the verso. A plate mark impressed by Karsh’s studio surrounding the image gives the image further depth. The sheet measures 13.5 x 11.56 inches (34.3 x 26.9 cm), the image 9.43 x 7.5 inches (24 x 19 cm). 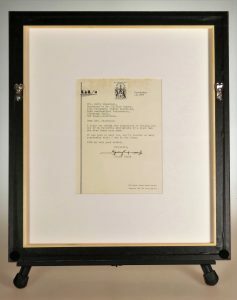 Printing date is established by the letter and the fact that Karsh stopped signing his photos with “Ottawa” in the late 1960s. The image verso bears the studio stamp of Karsh’s Ottawa studio reading “COPYRIGHT | the following copyright must be used | © Karsh, Ottawa” as well as a penciled “P of G” notation referring to the image’s inclusion in Karsh’s book Portraits of Greatness(1959). We deliberately chose not to frame in the conventional manner, with the photo matted and framed beside the letter. The photo is simply too striking an image to warrant the aesthetic distraction of the letter right beside it. Instead, we commissioned a custom, double-sided frame using museum quality, archival materials. The solid walnut frame is stained dark black with a thick 8-ply rag board mat for added depth and richness and is glazed with UV filtering acrylic. On the reverse the letter has also been matted and glazed. The framed piece measures 17.375 x 15.375 inches (44.1 x 39 cm). ← A fight at CBC!